Today, success is all about delivering provable, repeatable, quality – that is what Paul Turner, MD of specialist engineering firm, GB Precision believes. Which is why he has recently invested in Mitutoyo’s latest U-Wave Measurement Data Wireless Communication System, not only speeding up general metrology activity, but also significantly reducing final inspection times – as well as reducing the opportunity for human error. The U-Wave system enables easy wireless data communication from a wide variety of measuring tools, including calipers, micrometers, height gauges, etc. (in fact any tool that provides Digimatic output) direct to a PC. 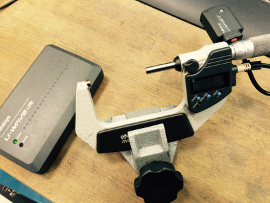 Because the devices are cordless, measurement no longer has to take place near the PC, allowing much greater freedom of layout within and beyond the inspection area.